Detail your Nissan's rims with these Simulated Carbon Fiber "Polyurethane Domed" gems that can fit in the wheel's centercap. "Domed" decals are not just vinyl decals. They are a tactile, three (3) dimensional decal that looks like a factory manufactured emblem. They look Fantastic! 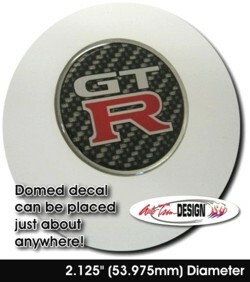 While this item is advertised for use on wheel centercaps, these decals can be used just about anywhere. We recommend measuring your wheel's centercap prior to ordering.